There is great news for the Tesla Model 3 reservation holders and enthusiasts from Europe — Tesla is officially displaying the Model 3 across European countries starting today from Amsterdam, Netherlands. You can sign-up for the event by going to the Tesla website and looking for events near your location (this link lists all the European event locations, dates and timings). Tesla Model 3 reservation holders should check their emails as several European reservation holders are reporting that they received the invite to a Tesla Model 3 Meetup near their location, enthusiasts can also signup. Although you can experience the Model 3 first hand at a Tesla Store near you in Europe, Tesla is not yet offering test drives for the Model 3s — these are probably European Model 3 versions previously spotted. Tesla is also now actively registering VINs for European Model 3 compact electric sedans. u/Kokaigen received the following email to a German Model 3 Meetup event tomorrow i.e. 14th November. 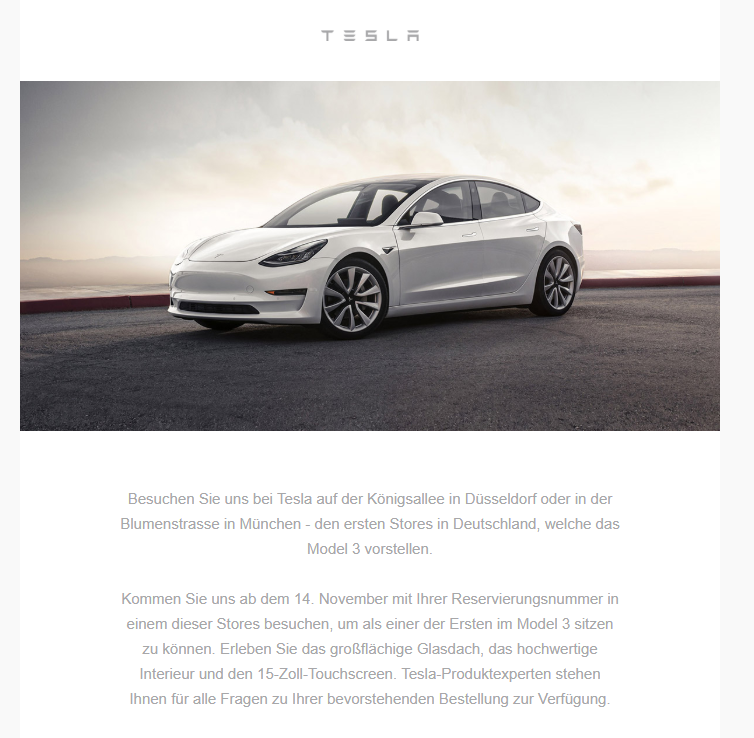 Tesla Model 3 invite email for Germany. Following is the lost of locations in Europe where Tesla Model 3 is going to be on display this month: (Check Tesla website for full info and sign-up). Let us know how your experience went while at a Tesla Model 3 display and meetup event in Europe in the comments section below.